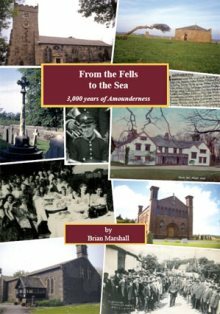 In ‘From the Fells to the Sea,’ Brian Marshall deals with a broad sweep of Amounderness life embracing archaeology, Roman history, religious matters, architecture, genealogy, place names and family names and includes topics as unlikely as medieval ploughing and the production of Lancashire cheese. This book is a must for anyone interested in the comings and goings of Amounderness folk, whether the tales of a Pilling postman of the early 20th. century or a series of unexplained 'graves' of 2,000 years ago. If you would like a copy, please call 01253 812 017 or 01253 812 209 and leave your name, address and telephone number.